A Eurasian native, very well established (though usually ignored by collectors) throughout Michigan. Moist to dry roadsides, fields, clearings, shores; invading open forests and thickets. First collected in 1871 in Wayne Co., but found in the 1880’s in counties as far apart as Keweenaw, Emmet, and Ingham. Though no collections are known, the species was listed by the First Survey, so presumably it was in the state as early as 1838. The common weed has presumably (in part, at least) reverted to the wild from cultivation, where strains are grown for their fleshy whitish edible roots. 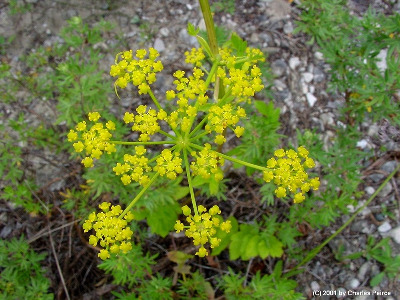 “Wild” plants have the same parsnip odor; the root is not poisonous to eat, despite a dubious reputation, but the foliage may be a serious skin irritant in sensitive people. The stems in this species are deeply furrowed and strongly angled. Very depauperate specimens may have leaves with only 3 leaflets. MICHIGAN FLORA ONLINE. A. A. Reznicek, E. G. Voss, & B. S. Walters. February 2011. University of Michigan. Web. April 26, 2019. https://michiganflora.net/species.aspx?id=134.